What can’t you buy online these days? You can scratch jumbo jets off that list. 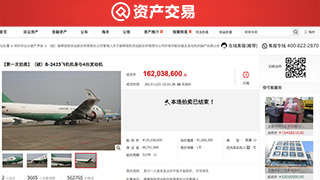 Two Boeing 747 planes have been sold on Chinese online shopping platform Taobao for a combined price of $62 million. The planes were previously owned by cargo company Jade Cargo International, but were seized by a court in the Chinese city of Shenzhen after Jade Cargo filed for bankruptcy in 2013. They will now be owned by Chinese cargo airline company SF Airlines, which outbid 25 other buyers. According to Chinese state media outlet Xinhua, the auction gathered over 800,000 viewers. The planes have been put up for auction (offline) six times since October 2015, but failed to find buyers until now. The courts decided to put them up for sale online in September, marking the first time that jets have been sold via an online auction in China. Last year, a Boeing 747 was listed for sale on eBay for the low, low price of US$299,000. But it was essentially a shell, with its engines removed and electrical components stripped out. According to Boeing, 747s typically sell for at least $386 million. But if you're still hoping for a 747 this Christmas, fret not. There's still one available on Taobao. The court originally came into possession of three airliners, and only two managed to sell. The usually efficient delivery of products purchased online could be a little trickier in this case – and returns could be a challenge as well.